The TRANSPACK XT1 backpack is designed, using the Patented Isosceles Storage System which utilizes two side pockets to carry ski/snowboard boots or skates that surround a triangular central compartment that keeps your gear and equipment separate and safe. The Isosceles Storage System diverts the weight and bulk of your boots to your sides and away from your back. 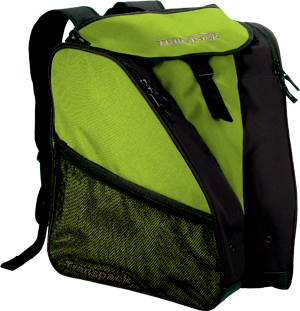 This natural suspension makes TRANSPACKÃƒÂ¯Ã‚Â¿Ã‚Â½ backpacks ergonomic and incredibly comfortable to wear which makes this bag one the shop favorites.